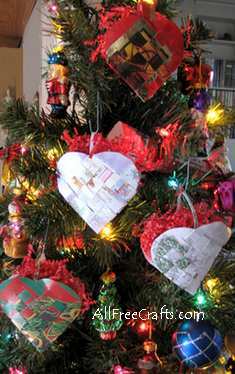 Hide little Christmas surprises in woven heart baskets made from recycled Christmas cards. Woven paper hearts have been around a while, but I wanted to find out if you could make these little woven heart baskets from recycled Christmas cards. The answer is yes – providing your template is the right size and you choose fairly thin, flexible cards. I also discovered that this is one of those crafts that is easy to do, once you know how, but it is not an easy craft to describe. I’ve seen some pretty awful tutorials for paper woven hearts, with lots of comments from confused people who have plain given up trying. So…I made a decision – rather than than try to redo what’s already out there, I’m going to tell you what I did – which began with a good look at this Paper Woven Hearts Tutorial, which includes large, step-by-step photos and detailed instructions. After you read through the steps, and perhaps made a prototype woven heart basket from paper, you’ll be ready to try making one from recycled greeting cards. There are some differences worth noting – even thin card stock is a lot less flexible than paper, so you must be patient and wiggle things around a little more until each strip is placed correctly. Don’t be afraid to bend the card, as shown here, as you work through the strips. 1. Print out the Card Basket Template, which should work with most medium-sized cards. For larger sizes, draw your own template or make my template bigger. Cut out the front of your card and fold it in half. Place the template with the flat edge against the fold and cut out. Cut two identical pieces using the template. For easy identification, from now on we’ll call these pieces, Card One and Card Two. 2. Hold the pieces at right angles to each other, then begin weaving. Take the first folded strip of Card One and push it through the first folded strip of Card Two. 3. Gently open the first strip of Card One, making it into an open loop, and push the second strip of Card Two through the gap. Let the loop of Card one close up and push it through the last loop of the third strip of Card Two. (Here’s where you might have to wiggle things around a bit to get it to fit). 4. To finish row one, push the last strip of Card Two through the loop of Card One. For the next three rows, repeat these steps, alternating the process to make a woven pattern. If you prefer video tutorials, see this Woven Heart Project on YouTube. This is the same method described above, with good visual instructions. Be aware, thought, the sound track is too loud, so you might want to turn down your speakers before viewing. If you think the folded woven pattern is just too challenging for children, here’s an alternative method that I found on YouTube. The process is easier because you make each side of the heart separately, using basic paper weaving techniques. This means there is no threading of strips through folded loops, but you fasten both sides together with double-sided tape. May I buy the instructopn books, and or patterns?